For Riordan fans, the title of the book is a spoiler. Magnus Chase. Chase. As in Annabeth Chase. Yes, the Annabeth from the Percy Jackson series. 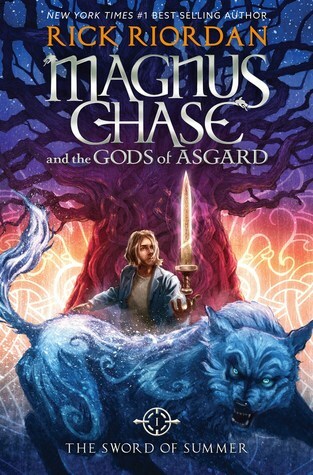 For those who haven't read any of Riordan's work before and Magnus Chase is your first, you have 10 books to wade through about Annabeth and the rest of the Camp Half-Blood crew. I actually just bought this book by chance. I've been losing track of the release dates of a few books (that's what happens when you read too many series and several of them are set to be released in the same month). However, seeing the stack of Magnus Chase and The Gods Of Asgards in my local bookstore, I automatically grabbed a copy and bought it. When the Percy Jackson and the Olympians and The Heroes of the Olympus series ended, many faithful readers were left clamoring for more. Since Riordan has been through three of the greatest mythologies (Greek, Roman, and Egyptian) it was about time he brought us the world of Vikings and Norse Gods. The funny thing is, Magnus (whose name was borrowed from Cassandra Clare's Shadow Hunter series) has really a lot in common with Percy. He lives with his mom (who I think was a bit of a hippie) and doesn't know who his father is. His world suddenly turned upside down when fire giants, mythical creatures, gods, and dying were thrown at his face. Amazingly, he just rolled with it. A fire giant attacking? No problem, just cut the dude’s nose with a magical un-rusted sword that's been stuck underwater for centuries. Dying? Oh, just escape this amazing hotel called Valhalla, where hacking each other to death every evening is the idea for entertainment. No worries on that one because everyone's right as rain the next day. You’ll have to read the book to know more about what I’m talking about. Magnus is also good with horses and amazing with sea stuff like fishing. Doesn’t that sound a bit familiar? With everything going on in this book—the quest, a rhyming premonition with a scary Nordic Fates, a place where those who died valiantly gather and practice killing while waiting for the end of the world, and even gods wanting to hurry that end of the world—you’ll feel right at home in this new series if you miss Percy Jackson and his crew. And the magic sword—never forget the magic sword.